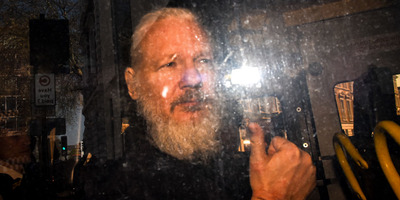 Alberto Pezzali/NurPhoto via Getty ImagesWikileaks founder Julian Assange makes his way into the Westminster Magistrates Court after being arrested this morning by Metropolitan Police, on behalf of US authorities, London on April 11, 2019. Among the allegations, the government said it spent $US6.2 million on security and maintaining Assange at the embassy between 2012 and 2018. Interior Minister Maria Paula Romo told reporters that Assange had gotten away with improper conduct, including putting “faeces on the walls of the embassy and behaviours of that nature.” Moreno told the Guardian that Assange maintained “improper hygiene” which affected his health and the entire embassy environment. Assange’s lawyer Jennifer Robinson denied allegations of poor behaviour during Assange’s stay at the embassy, and said they are being used to “justify” Assange’s arrest at the hands of British police.